As you prepare to have your roof redone, you will need to consult with a contractor about changing the pitch or roofing angle to address the standing water. 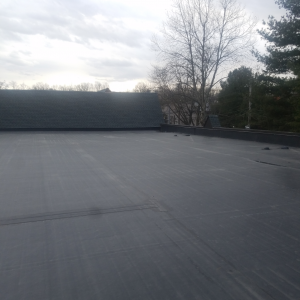 An experienced roofer will look at the location of your roof and determine the best way to address any drainage issues you are currently experiencing, but they will also consider how to prevent potential flow problems with the new roof. With a flat roof that is open on at least one side, the roof can be built up to create a natural slope to propel the water over the open edge. If the pitch was at a 1/8 of an inch prior, it is wise to increase the slope to ¼ of inch per foot to ensure the water moves in the right direction. There is minimal visual difference between the slope angles, yet there is considerable difference in effectiveness. If increased elevation will not work, there is an option to add draining systems to the perimeter of the roof. If your roof is surrounded by a retaining wall or has significant obstruction to water flowing off the roof, this will be your only option. Adding scuppers or drain pipes with inlets when the roof replacement occurs can protect from water or structural damage and encourage proper drainage. With the help of Olivieri Roofing, your drainage concerns will be addressed efficiently and effectively. Contact them today for an estimate on having your flat roof replaced.